Sam Bennett wasn’t deterred by the uphill finish in the Tour of Turkey today. In fact, the Irish fast man showed his all round ability to dominate and win again. Sam Bennett has won the second stage of the Tour of Turkey; with the race leader’s jersey on his back and sprinting up a climb. The end of the 183.3km stage from Tekirdağ to Eceabat was very undulating, with changes of gradient and a climb to the finish line the order of the day. 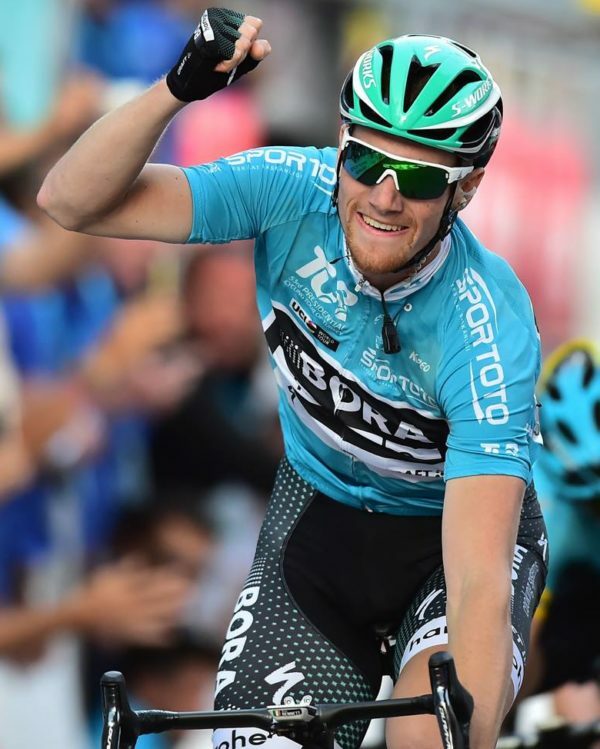 However, the Carrick-on-Suir man’s Bora-hansgrohe squad led into the base of the climb and Sam Bennett then finished the job in some style. And to top the great job his team mates did, Felix Großschartner took 2nd on the stage just behind the Irish winner for a Bora-hansgrohe 1-2. Gaps also opened up back through the field which means Bennett’s overall lead has now been extended. Bennett had also won the opening stage yesterday. Today’s win was his ninth stage victory at the Tour of Turkey in the past three years. And it was his sixth win of the 2019 season, which is only a couple of months old; Bennett in rampant form of late.More to come. Tour of Turkey stage 2 podium; a smiling Sam Bennett in the middle after another fantastic win for the Irish pro cyclist. 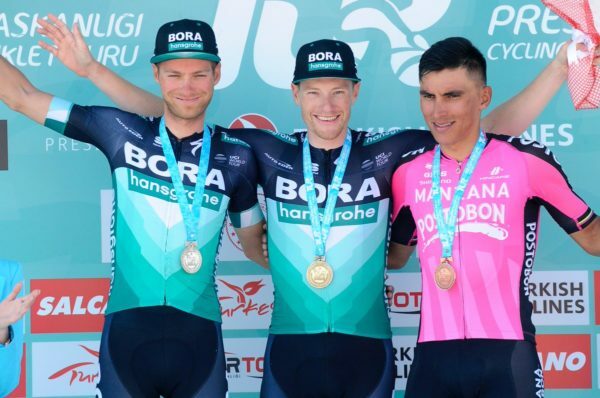 After riding so well last week in the Tour of the Basque Country, when it won four of the six stages, Bora-hansgrohe were brilliant again today. Not only did their riders take the stage with Bennett – who also leads the points classification – but it fired Lukas Pöstlberger up the road for a late effort. The Austrian pulled out a very good gap on his own and it looked for a time like he may just survive to win. However, the hard effort off the front combined with the climb to the line saw him tie up. Bennett was lurking in the clutch of riders that had formed a select group just behind the line leader. And when it was clear Pöstlberger was going to be swallowed up, Sam Bennett stepped up; surging from the group and demolishing the sprint. He pulled out several lengths the moment he kicked. And even though he paused to look around before savoring his win, he still won it by a considerable margin. For his part; Pöstlberger was swamped by the group before the line and took 15th place. Just seven riders were credited with the same time as the Irish stage winner. Sam Bennett now leads overall by 14 seconds from Großschartner. In third place comes Jhonatan Restrepo Valencia (Manzana Postobon); the 24-year-old Colombian also 3rd on the stage today.